It’s the voice that you can’t miss, right from very beginning - a warm, seasoned instrument in its own right that brings to life each of the fourteen songs on this latest album by the voice’s owner, time-served roots and acoustic singer-songwriter, Mike Silver. Accompanied by his crystal-clear guitar work, together with restrained instrumental and vocal accompaniment, Mike makes each of these songs – all created by other writers and musicians – totally his own. It’s a fascinating collection, including narrative ballads by Mike’s beloved (and now sadly departed) friend and fellow musician Ewen Carruthers, as well as melodies from the folk tradition, plus classic jazz and Americana songs – all of which are treated with respect and affection, with the re-invention of each song as if it were freshly minted and brand-new. So whilst you may have heard traditional songs like The Water is Wide and Lord Franklin many times before, in Mike’s hands, they slip the moorings of their historic roots and speak to the listener as if these were songs of a modern era, addressing love in our time and the tragedy of loss on today’s high seas. It’s rare for singers from the folk tradition to take on songs sung by vocal greats such as Ray Charles, Nat ‘King’ Cole and Josh White, but Mike sings Charles’ Lucky Old Sun, Cole’s Nature Boy and Abel Meeropol's (aka Lewis Allan) chilling Strange Fruit (about lynching in the USA’s southern states) with deft assurance, once again easing them from their expected contexts of smoky period jazz, and re-imagining them as contemporary ballads whose messages are timeless and universal. Many musicians have covered Bob Dylan songs, but Mike takes Dylan’s Boots of Spanish Leather, and transforms it into a ballad that sounds as if it has a heritage of centuries. 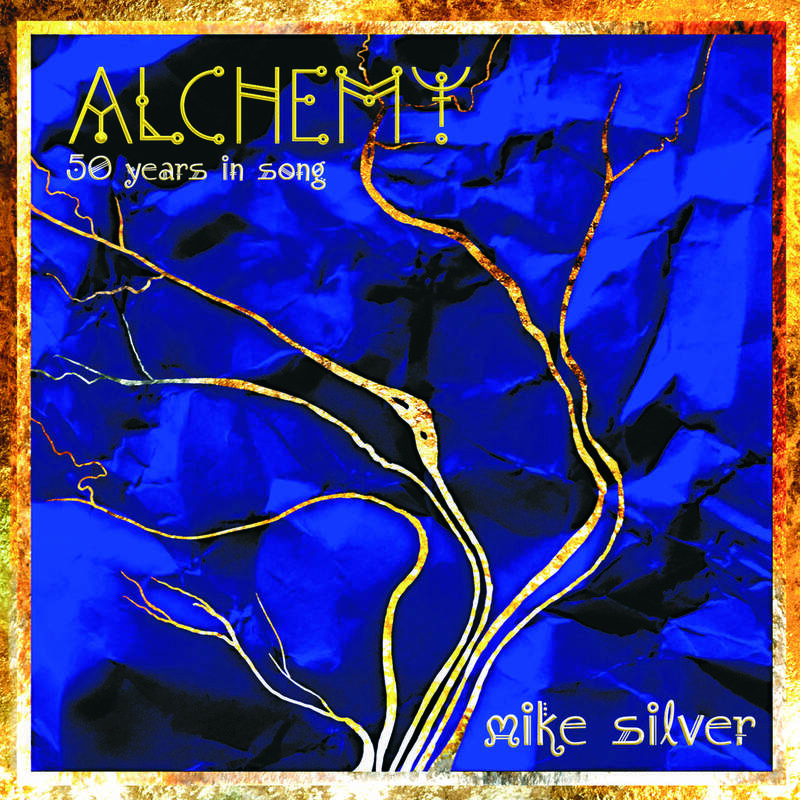 The words are brought to life anew when sung in Mike’s rich voice, and – as with each of the songs on the album - Mike’s fluid guitar accompaniment, and tasteful instrumental flourishes by guest musicians Nils Tuxen and Jo Partridge, ensure that each song is imbued with its own character and memorability. 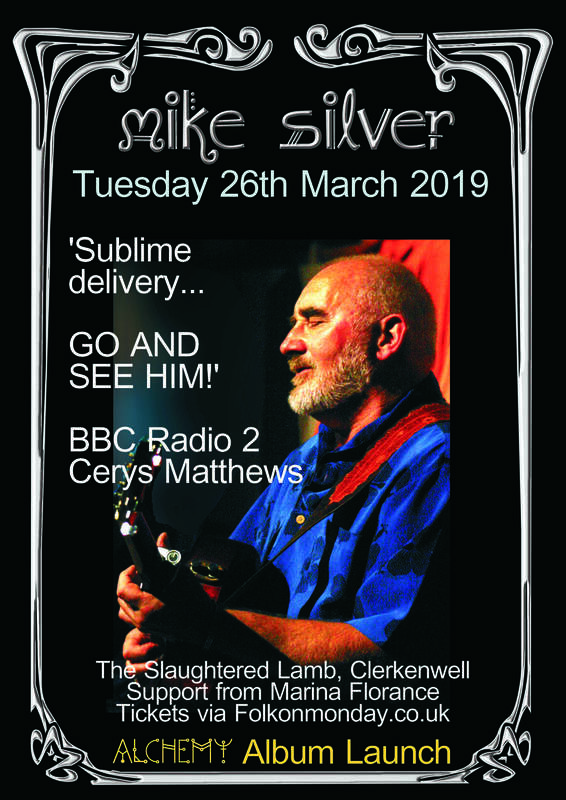 So treat yourself to Mike Silver’s Silver Collection, and you’ll be assured of a refreshing re-introduction to songs that you will already know and love, now presented with originality and affection by this consummately skilful and sensitive artiste. 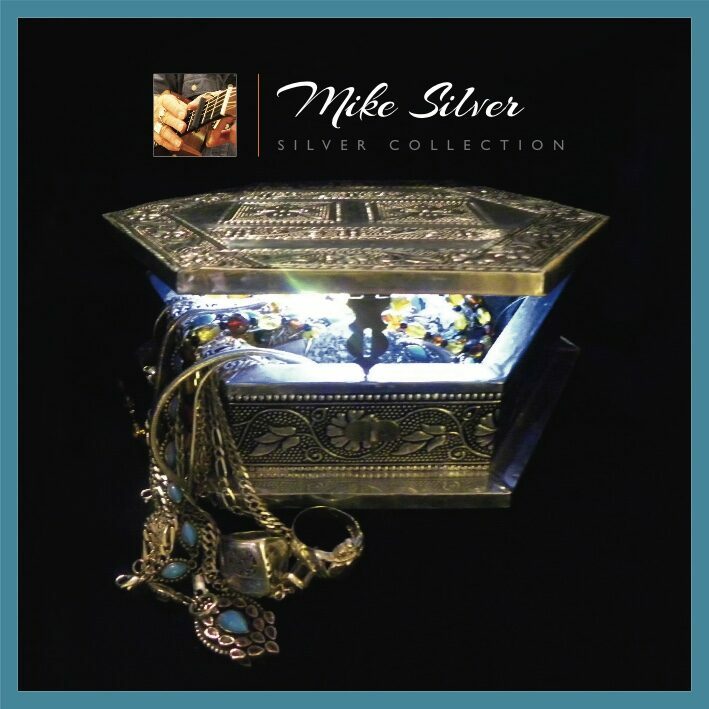 As much as I have loved Mike Silver’s songwriting over the years, there is something enchanting about this collection of covers. Four of the 14 are by Silver’s erstwhile collaborator, the late Ewen Carruthers, and all of these are gems, although the absolute jewel is Paris, the opening song that kicks off the album with a perfect atmospheric piece of stature. The rendition of the old standard, Lucky Old Sun, is rock solid and features a blinding guitar solo courtesy of Jo Partridge and tasteful pedal steel guitar by Nils Tuxen. Dylan gets the Silver treatment with Boots Of Spanish Leather, and there’s even a version of The Water Is Wide, which is brilliant. If I tell you that there are also versions of Strange Fruit and The Autumn Leaves you should get a feel for the breadth of material here. I love the arrangement of the Townes van Zandt classic, Snowing On Raton, again with excellent pedal steel guitar from Nils Tuxen. Eric Bogle’s Safe In The Harbour is also outstanding as a solo piece. If I have to single out one track for inspiration though, it has to be a John Richards song, Foundryman’s Daughter, which sounds like it has heritage but is seemingly quite new, and which features beautiful harmonies by Julie Boreham. Now that Silver is in his 70th year, still continuing to tour extensively and coming up with product such as this is heartening. I just wish he’d come up to Scotland again. If alchemy exists you can find the gold here without question. Long revered as one of this country’s most accomplished singer-songwriter-guitarists, Mike now takes the bold and (for him) unprecedented step of recording an entire album of covers. Importantly every song he has chosen for this record has touched him in some way, helping and sustaining him along the road. 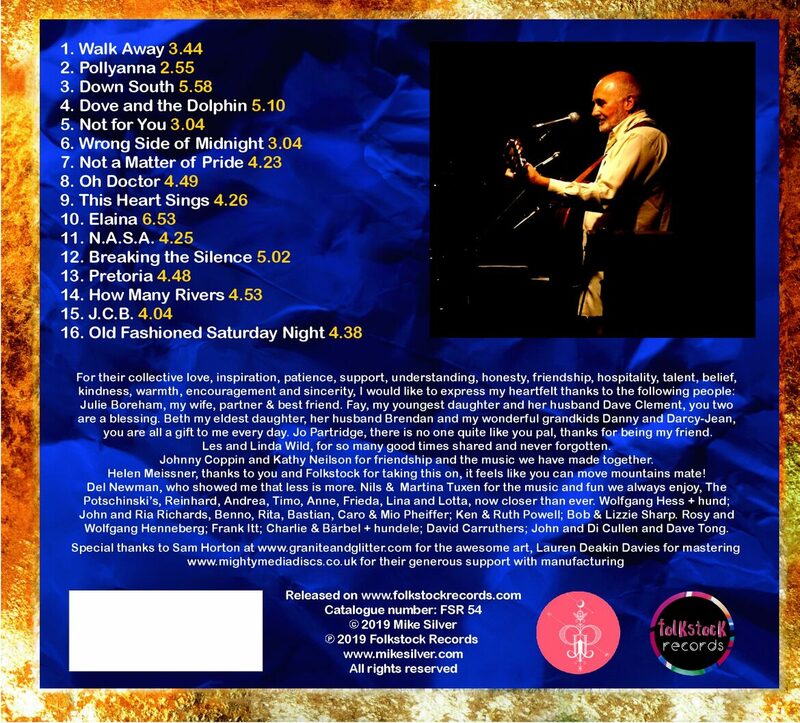 Repertoire-wise Mike has taken his cue from formative performances in folk clubs, where there was no arbitrarily imposed barrier between traditional and contemporary and artists just sang the songs they loved. So this humble, honest-to-goodness, Silver Collection unashamedly takes in traditional ballads (Lord Franklin, The Water is Wide), jazz and other standards (Lucky Old Sun, The Autumn Leaves, Nature Boy, Strange Fruit - the latter especially brilliantly done) and an exemplary choice of songs from his peers (Dylan, van Zandt Eric Bogle John Richards. But pride of place goes to four compositions by the late, great Ewen Carruthers, whom Mike was privileged to call a close friend; two of Ewen’s finest creations (Paris and Was it You?) bookend this disc. I can recall instances where perfectly good songwriters have recorded covers as a lazy smoke screen for having no decent new material of their own, or even in a vain misguided bid for commercial acceptance. However there isn’t the merest of dubious motive with Mike, for it’s abundantly clear that theses songs have made their mark on his psyche long-term. It takes a special talent to offer such supremely sensitive, caring and very personal renditions, and Mike’s contain many thrilling insights not least in the phrasing and expressive dynamics. His outstanding interpretive skills ensure that each song is freshly appraised yet with an unriavlled depth of understanding. He Moulds the lyrics and melodies ins own way, avoiding simply emulating the versions which inspired him, while paying them loving homage. Mike’s vocal performance is ideally complemented by beautifully simple instrumental accompaniments. Half of the fourteen songs employ just Mike’s own wonderfully mellifluous guitar, with its trademark less-is-more intricacy with not a note or nuance wasted. The remainder variously reply Nils Tuxen (guitars, dobro mandolin basses and Jo Partridge (electric guitar), and Julie Boreham’s magical vocal harmony graces The Foundryman’s Daughter. It might sound a worn cliche, but here Mike really does breathe new life into familiar songs, in intensely rewarding readings that destined to last. If anyone can capture a story, a movie, a vignette of time - then embrace it within the measure of a single song - it’s Mike Silver. Long heralded as a master craftsman of song-writing, singing and performing, his albums have retained a consistently high standard of storytelling and musicianship all down the years - and happily, his latest album, ‘Jack Dances’ further confirms his position as one of the UK’s foremost roots-and-acoustic singer-songwriters. The album title (referring to the fourth song on the CD) is a prime example of Mike’s ability to synthesise an entire life into just a few verses - and for everyone who’s ever attended a small-scale music gig, the scene will be eerily familiar. This is about the eternal drunk (‘Jack’ in the song’s title) who insists on getting between the audience and the performer and performing that self-absorbed, windmill-weaving seaweed dance so beloved of brain-fried hippie-generation lost souls who seem to populate bars all over the world. Mike nails the whole story in a scattering of perfectly honed verses, with the augmentation of supremely confident and competent guitar, plus his trademark rich, warm voice that so effortlessly soothes seduces and delights the ear. Family tribulations, holiday hell-holes, love songs (to a grandson and to a guitar!) all fall within the remit of Mike Silver’s song-writing abilities on ‘Jack Dances’ - but their seemingly effortless ebb and flow, their soft sinuousness and vivid memorability, bespeak an artist who labours long and hard to create perfect and crystalline songs of vividness, purity and perfection. Ably partnered by Nils Tuxen on dobro, Christi Andropolis on fiddle and Stewart Hardy on violin and viola, ‘Jack Dances’ is a master-class in restraint and time-served musicianship. So if you appreciate true artistry, great songs - and all the trademark brilliance to be expected of Mike Silver, ‘Jack Dances’ is definitely one for your collection! When preparing a new album, there is always a conversation held about whether or not lyrics should be printed in the sleeve cover? 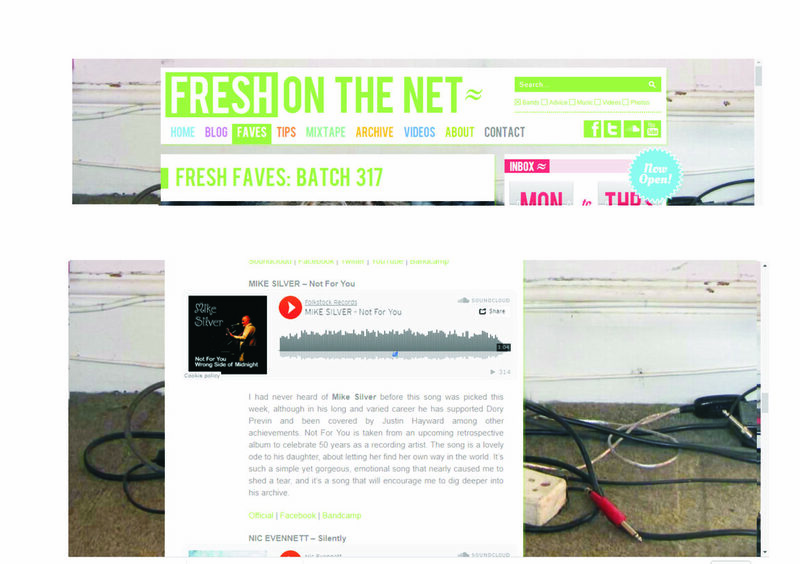 From a listeners point of view..It's always a bonus when you are enjoying an album to be able to enjoy the lyrics too. Or if you love a song so much you want to learn how to play it or sing it yourself. Having the lyrics in print, means it makes the job a little bit easier when you do start to get to grips with the song. So with my new album (Available now) I have decided on trying another angle, which is to upload the lyrics into my web site on the CD and tracklistings page. You just click on the link provided and it will open up giving you the option to either save it on your PC or print it out so you have a larger more readable version available. I would be interested to find out what you think about doing this way? Mike his working in Europe at the moment. His tour dates can be found on the gig guide. On his return he continues to work throughout the UK as a solo artists and along side Johnny Coppin. Mike has also just taken delivery of his new 'Powell' Guitar. Further details to follow soon. As a musical performer have you ever wondered how others see you? Do you want to perform but don’t know how/where to begin the leap from home to stage? We may just be able to help you answer these questions and more! There will be a 3½ day performance workshop in the lovely surroundings of the village of Chackmore, Buckinghamshire where opportunities will exist for you to share performances with other workshop attendees and also pick up hints, advice and tips on all aspects of performance from experienced tutors. The course is not restricted to song writers or instrumentalists and will cover many aspects of musical performance. A very experienced performer and commensurate musician and song writer who has, (because of his ability to get right to the heart of what people are going for, facilitating their abilities in the process) already run many successful songwriting and vocals skills workshops both in UK and Europe - and continues to get requests to run more! A singer, songwriter and determined woman has spent the years since her family flew the nest honing her already considerable performance skills in local venues as well as on large folk festival stages. She regularly works with children & adults from 7 to 70 sharing her passion for music. This will be a unique opportunity to tap into a great wealth of knowledge on all aspects of musical performance. Mike and Linda know each other well having worked together and become firm friends along the way so the atmosphere, whilst focussing on the tasks in hand, will be both relaxed and enjoyable. Just home briefly before going to London, Trowbridge and Whitstable. The two Cornish concerts with Johnny were brilliant and we had a great turnout at both venues. The BVH is a super place to play; really cosy and lots of my friends from the 'Welly' singaround in Boscastle came to the gig and sang their heads off. The Western Hotel in St. Ives was really well attended and there seems to be a rumour that we're going to play the St. Ives festival next year which will be just the job. Had to make an early start the next day to get to Hitchin on time but it was well worth the effort. I supported Aly Bain and Phil Cunningham and they were simply out of this world; wonderful entertainment and breathtaking musicianship. I thought it was very gracious of them to remind the audience about my set before they played their last set of tunes. It was lovely that Julie was able to come along for the ride and we had a few days visiting friends and family before heading off to South Wales to play Newport Folk Club and the Valley Folk Club at Pontardawe. We were given a warm welcome by everyone at both clubs and it was very enjoyable to play acoustically at the Valley. After using a PA almost exclusively for so many years, I have rediscoverd the joy and simplicity of just a room, people and no microphone barrier. If the opportunities present themselves I'll be doing more of this. The last stop before coming home was to play The Acoustic Tearoom in Kirkby Stephen., Cumbria. Fantastic night! Penny and Paul run a really tight ship, the venue (their promotions now take place at the Masonic Hall in 'KS') is just about perfect, the food was delightful, Penny does it all herself; and we were sold out. I really enjoyed myself, managed to take care of one or two requests for favourites and played the last song without the PA just for fun. The year ahead looks like it’s going to be fairly full-on, There are some miles to travel and it will be great to be playing some dates alongside Johnny Coppin again, he is such a brilliant musician and when we sing together it gets close to flying! My first working day this year was a short trip to Germany to play some session guitar for Reinhard Mey’s new album www.reinhard-mey.de Reinhard is well loved by his audience, he writes in French as well as German and his tours take him to many cities all over Europe, he’s a talented writer and a real gent too. It seems that Old Fashioned Saturday Night is his family ‘anthem’. I worked on a recording of his two years ago and afterwards he wrote me a charming letter thanking me and enclosed a DVD which he had put together with OFSN as background music. It was just for the weekend but I had a brilliant time working with his producer and now a good friend Manfred Leuchter. My other breaking news is that I have just heard that I have been booked to play Wimborne Folk Festival www.wimbornefolkfestival.co.uk this year. I honestly can’t remember how many times I have played there but it has to be close to the most I have ever played any festival. This is a great club of many years standing and viewed with love and respect by many visiting artists and they can’t half sing too! In recent years, since I moved to Cornwall, I have been going to a few singarounds locally and rediscovered the joy of playing acoustically and incidentally, the relief, of not having to schlep a sound system up narrow stairways etc. and through myriad doors that all open the other way! 5th March 8.00pm Beehive Folk Club 16 Union Street Harthill Sheffield South Yorks S26 7YH Contact: Peter Garratt 0114 235 2850. garratt-p@sky.com This my first gig with Johnny this year, looking forward to it a lot! 12th March 8.00pm. Boscastle Village Hall with Johnny Coppin. The ‘BVH’ is a lovely venue, intimate with a warm atmosphere. Bring your own ‘refreshment’ or walk to the Napoleon just up the road for a pint. The tickets are £10.00; we can’t get a huge number of people in and some seats are already gone (the Cornish bush telegraph is too efficient sometimes) so it is best to book up soon. Please send an email to info@mikesilver.co.uk or call 07886 813343 to reserve. 13th March 8.00pm. Weston Hotel St Ives with Johnny Coppin. This one is for you chaps and chapesses that live ‘down Cornwall’. The Weston is special; the stage area is down on a lower level with some seating and there more places a few steps higher. Tickets are £9.00 (because this venue is bigger than the ‘BVH’) however some seats have already been reserved so booking early, info@mikesilver.co.uk or call 07886 813343, is favourite. 14th March Hitchin Folk Club www.hitchinfolkclub.idnet.net I am supporting Aly Bain and Phil Cunningham this time and can’t wait to be back there again. 18th March, Newport Folk Club www.newportfolkclub.co.uk The Lyceum Tavern, it’s been a while since I played Newport, a friendly reception is always guaranteed. 19th March Pontardawe Folk Club www.pontardawefolkclub.co.uk The Ivy Bush Hotel 103 High Street, SA8 4JN. This is a club of very long standing and all of us on the road feel like we got a feather in our cap to be able to play there. 20th March The Acoustic Tea Room Kirkby Stephen Tel:- 017683 72123. Fax:- 017683 72132. acoustictearoom@aol.com www.acoustictearoom.com This is one of the best gigs on the planet to play. Penny and Paul, two of my favourite people, provide a really warm welcome, it’s a supper evening, wonderful home cooked food and a really warm atmosphere. I love this job! 25th March 8.00 pm Otterton Mill www.ottertonmill.com Box Office: 01395 568521 Otterton, Budleigh Salterton Devon EX9 7HG. Otterton Mill is so much more than an Arts Centre and well worth a visit just on its own merits. They serve excellent food and wine and it’s worth taking time to arrive early for a meal before the gig. This one sold out early last year and it was a lovely evening. 28thMarch Peewee’s Bar Trowbridge peeweehuntattheswan@hotmail.com Church Street Trowbridge BA14 8DR. Peewee is great guy and a good mate from a long time back. His love of music makes it always a pleasure to be in his company. I do hope that you’ll be able to come to one, or more, of these shows, I have a number of new songs to share with you and wonderful new guitar made by Ken Powell www.powellguitars.com to show off. Ken builds truly remarkable instruments and this one is really special.